"All of the granberry staff was there along the way to answer all of our questions and show guidance. Even two males, at Granberry there was never a moment where I felt different than another other couple. It was the best day of my life!" "Our friends and family are still talking about our wedding and how awesome it was! I had no worries or stress because I knew Courtney was going to take care of us. Thank you Courtney & Granberry Girls for all you did for us and for helping make our dream wedding a reality." "Natalie made my wedding day and I am so happy she was there every step of the way. I honestly could not have had a more perfect coordinator. She made the night a breeze and our wedding was perfect. Everything turned out beautiful!" "Words can't express how beautiful my wedding was at Granberry Hills. It was everything that I could have imagined and more. If you are looking for an affordable venue that makes sure that your day will be stress free, this is the place!" 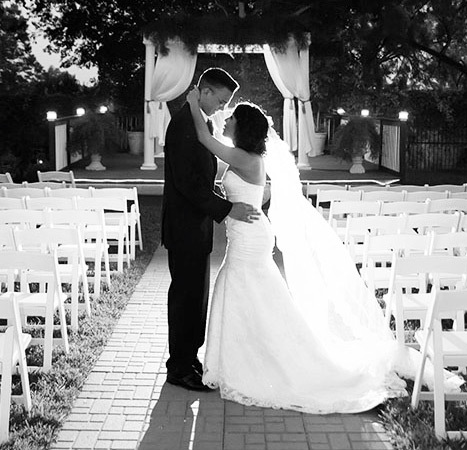 Granberry Hills is the ideal location to host your wedding, quinceañera, or corporate event. Granberry Hills offers the aesthetic beauty of outdoor events with the conveniences of superior indoor facilities. Set on 15 impeccably landscaped acres with easy access to downtown hotels for out-of-town guests, our venues can accommodate events large or small. Whether you choose to have your event on the Gardenside Courtyard & Ballroom or on the Hillside Covered Pavilion & Ballroom, you will be assisted by an on-site Event Manager to ensure every detail is attended to with professionalism and excellence. Our staff will handle all the setup and cleanup to relieve you of any additional stress. Call (210) 590-8067 and speak to one of our on-site Event Managers to schedule a time for a tour!